Kel Assouf, the Tuareg band around Anana Harouna (Niger), is ready for a next phase. 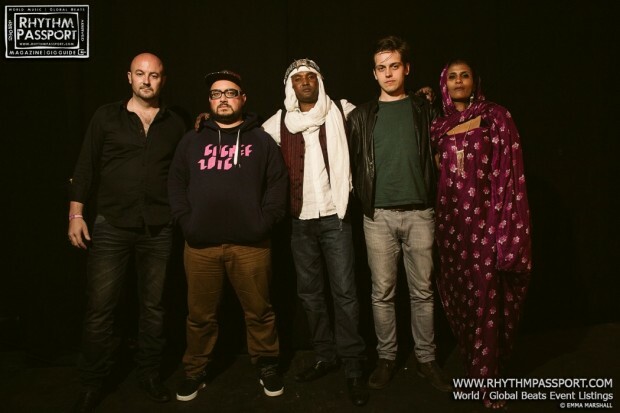 New member Toulou Kiki (also actress in the award-winning movie Timbuktu) adds the matriarchal element to the repertoire, and Tunisian producer/musician Sofyann Ben Youssef took the band to a whole new level, working on a very contemporary sound. The result: Tuareg desert rock with dragging drums, cutting guitar riffs and Tamasheq chants. Kel Assouf are the people from nostalgia, the sons of eternity, of solitude and the desert. Kel Assouf was created in Brussels in 2006 around exiled Tuareg musician Anana Harouna. From the beginning the band built its identity around Tuareg culture, their battle against discrimination and their struggle for peace and respect. In February 2016 Kel Assouf released a second album, named Tikounen, which stands for astonishment, perplexity, and expresses a cry of impotence in the face of the violence, injustice and pollution in the world. With one foot in the desert and the other in the urban jungle, Anana writes about situations from the Sahara, Niger, about daily life, here and there, in simple and short phrasings similar to those of Japanese haikus, Anana sings his poetry for mankind and respect. Since the first album Tin Hinane (IglooMondo, 2010), the band around Anana Harouna has changed but the spirit is still there. The Tuareg spirit has even grown thanks to the collaboration with singer Toulou Kiki. The collaboration with Tunisian producer Sofyann Ben Youssef has been extremely refreshing, submerging the music of Kel Assouf in modernity. With a production that is tradi-modern, at times hyper modern, he pushes the group to the forefront of the platoon of contemporary desert rock and amplifies the feeling of astonishment. The African rhythms played by rock musicians brings the music to the dance floor, somewhere in between London and Niamey. The show is organised in collaboration with Zephyrus Records, Belgium.